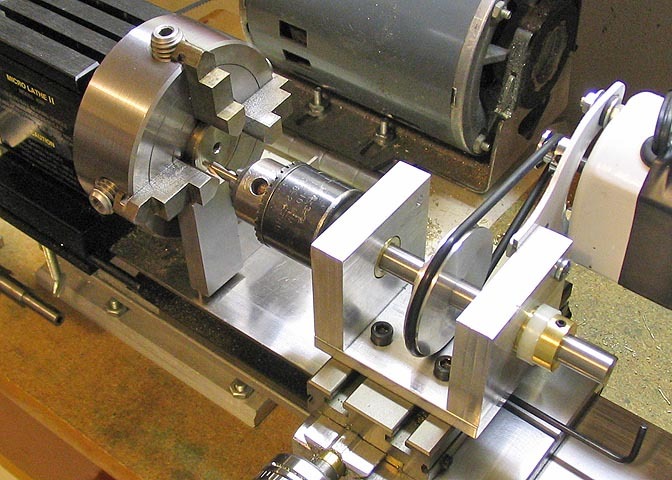 gears for a Sherline lathe I once owned. All with single tool point flycutter set-ups. gear cutting chores much quicker, once I have the set-up for making the cutters. interest in this method, and maybe in some of my comments. suit individual needs, and dimensions adjusted as needed. (Note: This is an addition to my initial publication of this web page. 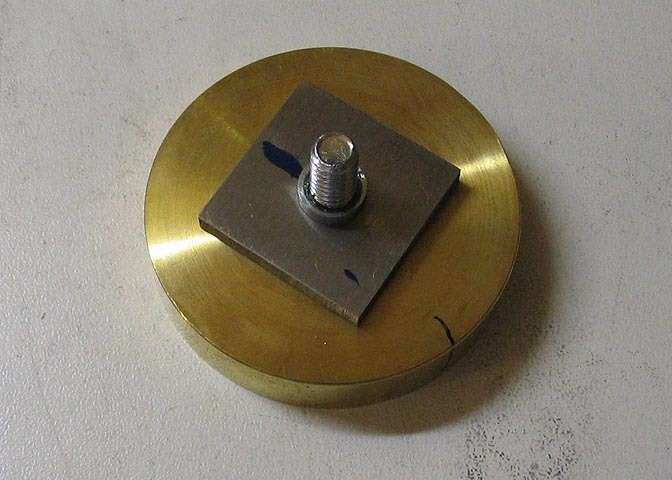 to let the base sit firmly without any wobble. 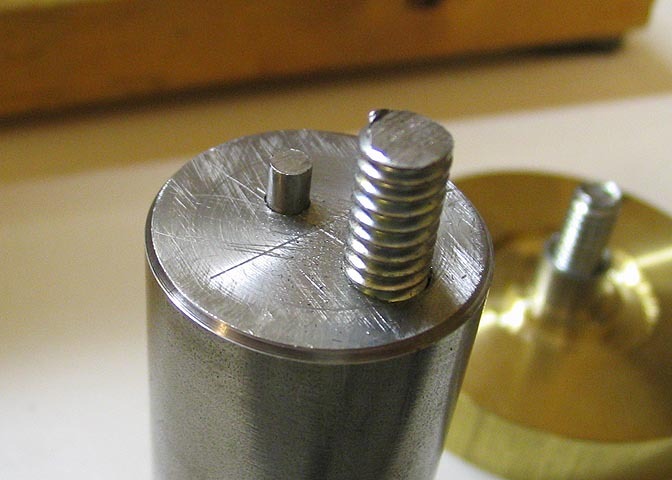 I turned the base over, faced it, and spotted, drilled, and tapped for 1/4-20 threads. when tapping a hole. This must be turned off so the surface of the base plate is flat. to be this size too. 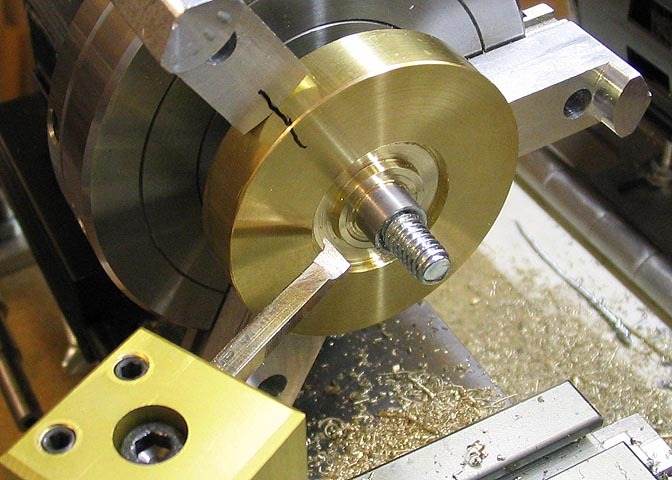 brass drilling base, (previous picture). enough to let you insert a cutter for the next step. Turn a recess in the base about .15" deep and wide enough to allow your 1/8"
the corners of the recess square, but it's not necessary. 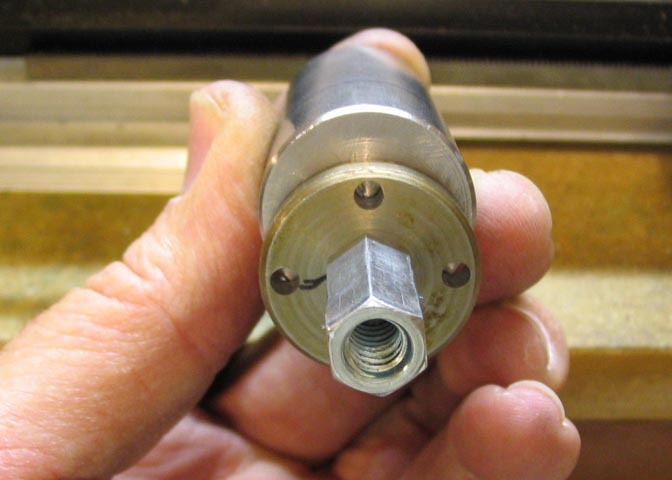 Turn a mounting nut with a shoulder that will fit the hole your drilling template. 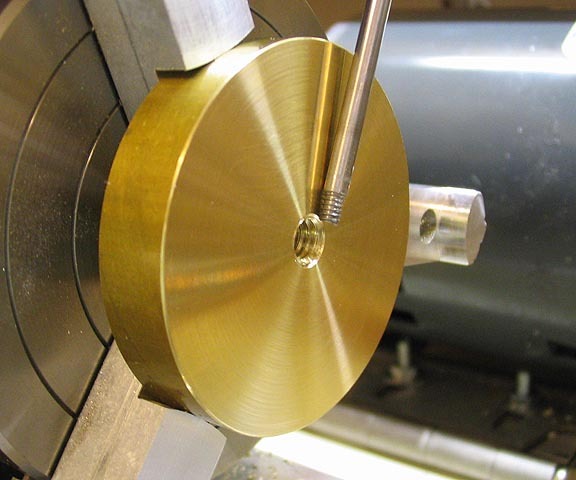 This will keep the template, and later, the cutter blank centered during later operations. 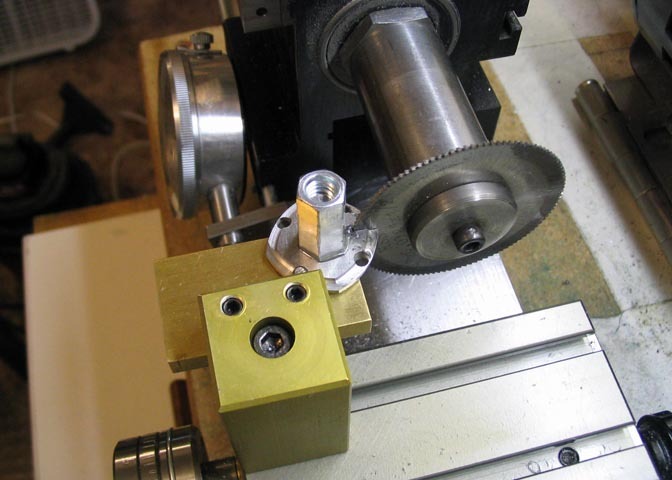 Drill and tap a 1/4-20 hole .250 off center in the end of an arbor that will fit your lathe. to make what suits you. shown. 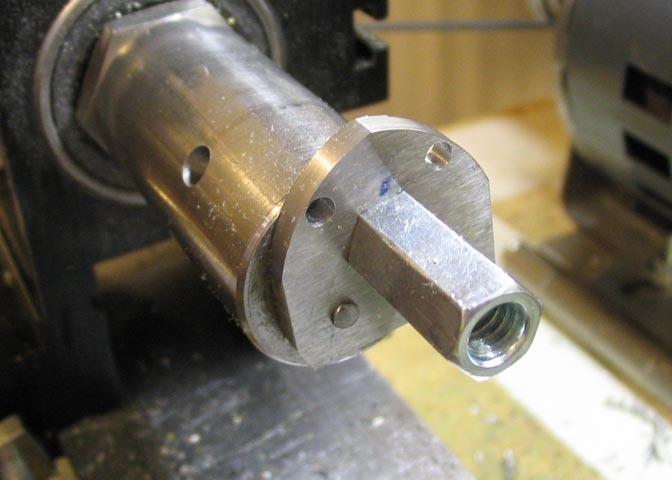 Then drill through the template hole at the 12 o'clock position, 3/8" deep, 1/8" dia. 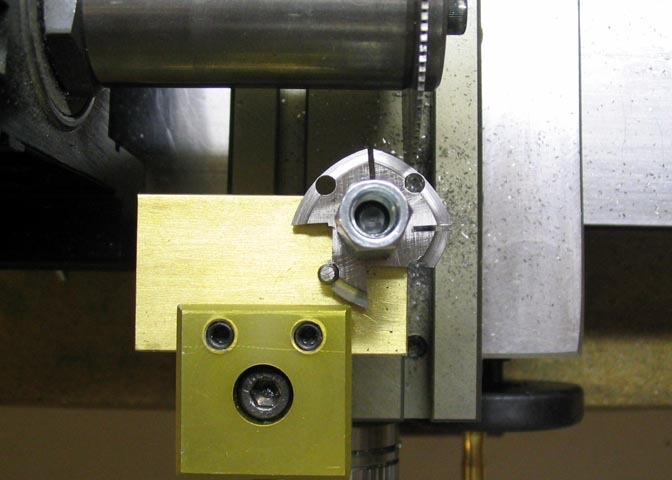 punch out the stud that will go into the hole, if needed. stick up above the surface just under 1/8". These are all the parts you should now have, with the exception of the part labeled "A". the holes for the studs. It is made the same way as the arbor shown in the previous picture. and tighten it down. 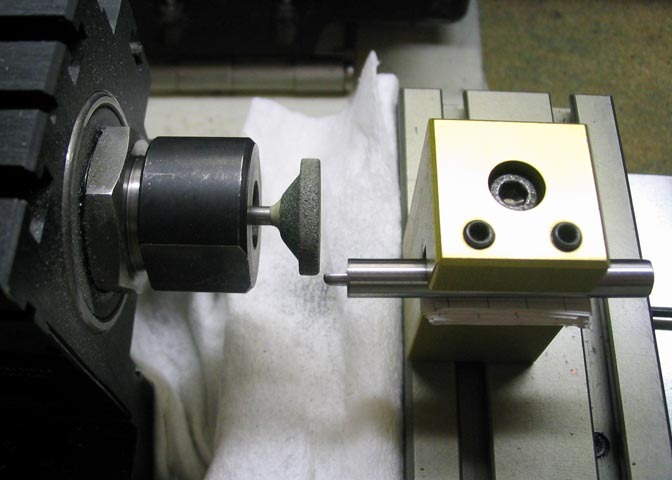 Drill the tool steel at each of the holes, 1/8". 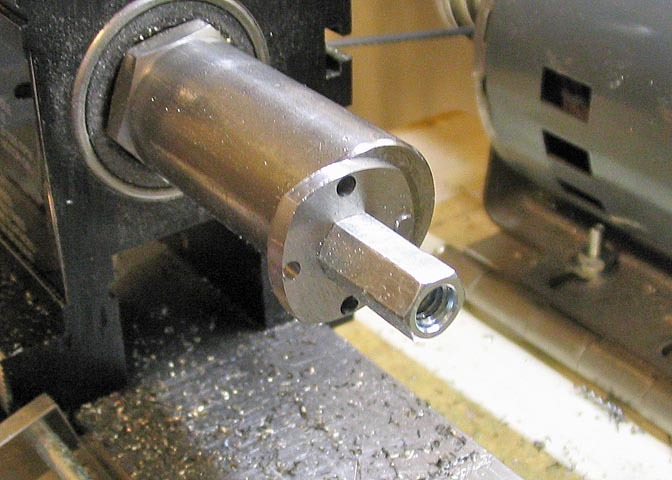 end of the coupling nut to keep it centered on the arbor stud. 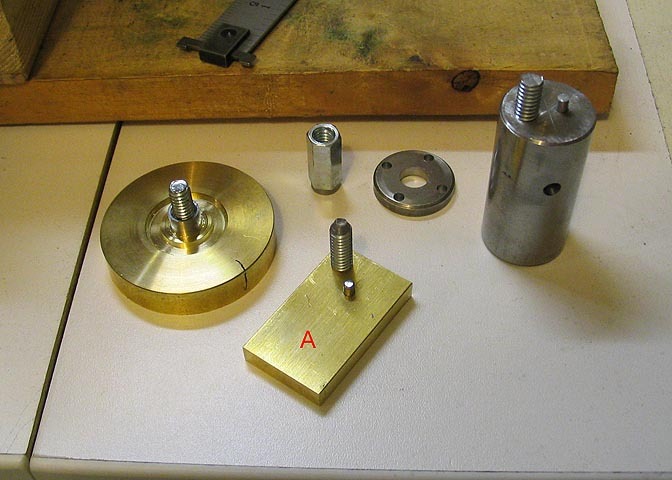 repeat that setting for each of the remaining three sides of the piece. This is the blank finished out, and ready for what ever profile is to be cut. tools. I was kind of surprised that the HSS cobalt bits dulled so quickly. 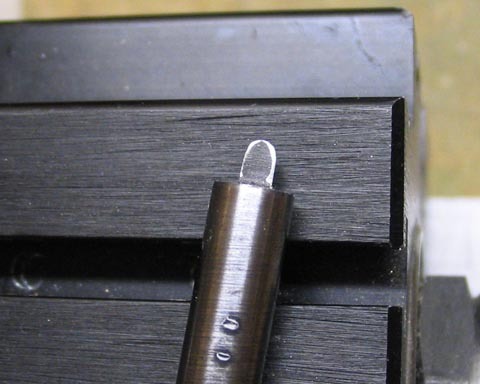 As soon as they start to dull, they will work harden the blank almost immediately. 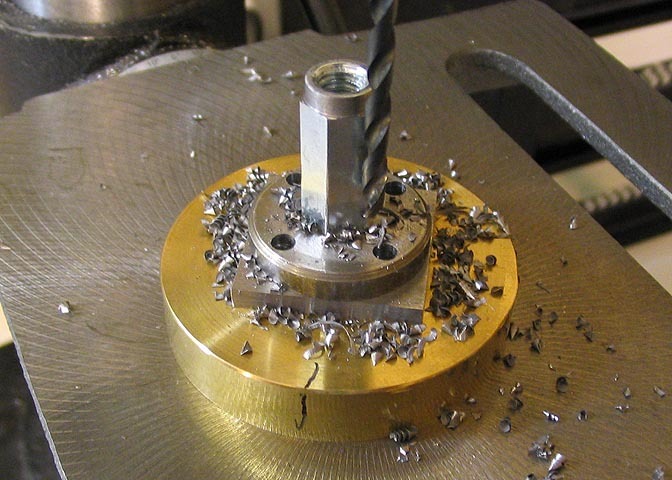 touch against a grinding wheel will remove the hardened spot. facet after all facets are roughed out. better than the more exotic alloys. Kind of like this. 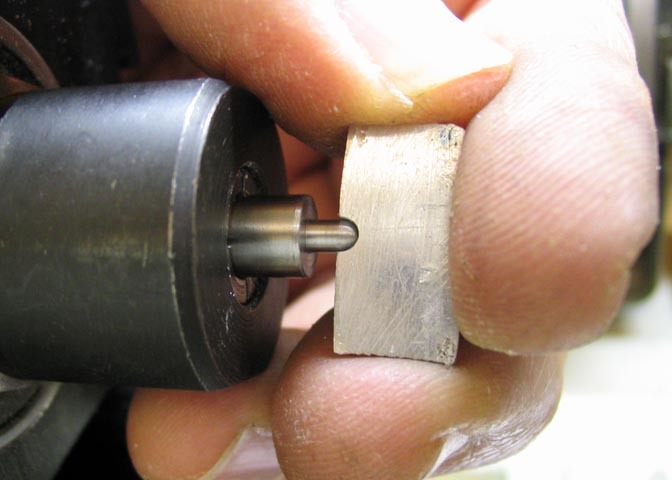 prevented chipping the tool point and work hardening the cutter blank. 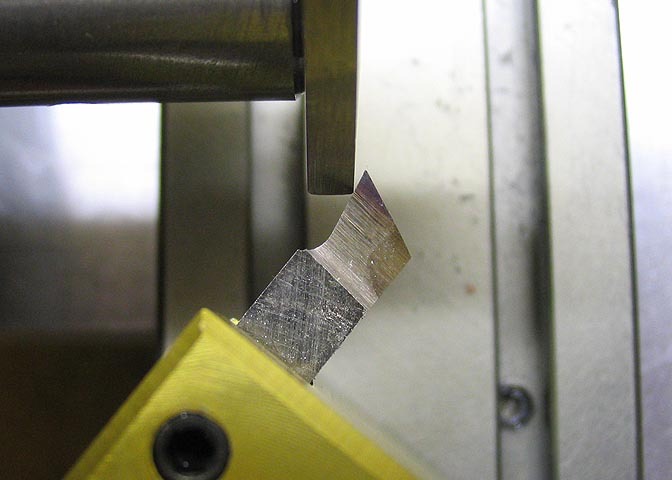 chipping and work hardening troubles. mainly in clock gears. 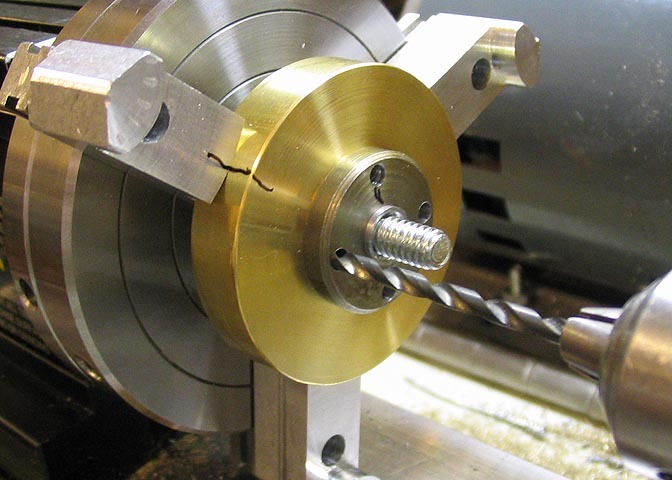 Involute gear profiles can be made in a similar manner. 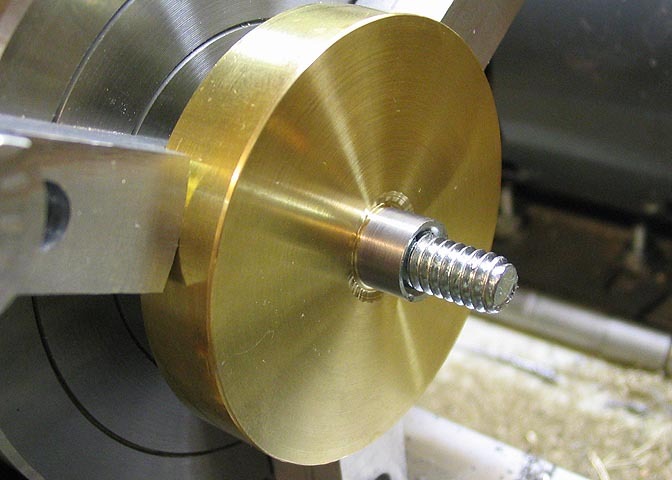 cutter, the dimensions mentioned here are for a Module 8 wheel (gear). 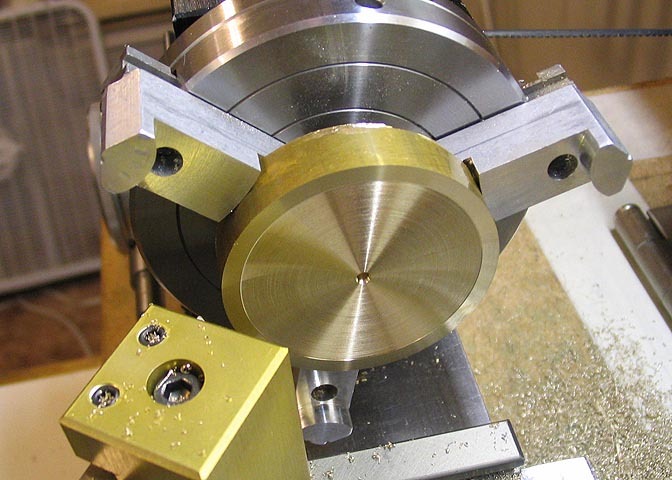 to judge when I had the correct radius on the end of the tool. .098". I ground it down until there was .049" left and that's it. hopefully to a straw/yellowish color, and again quenched. color, (at least for me). This one ended up a bit blue. 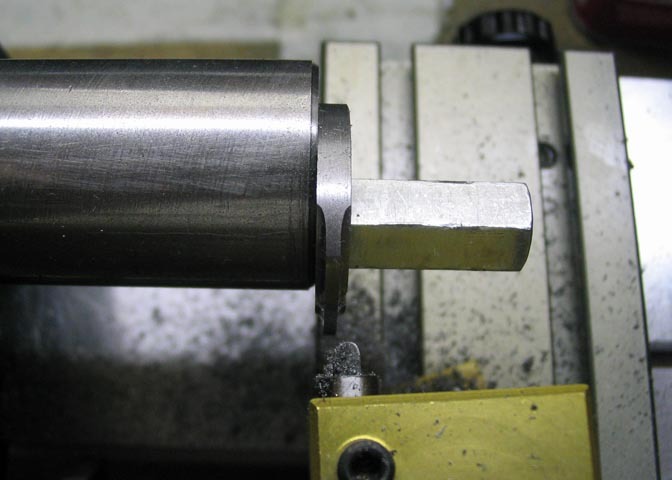 The final step is a light honing, and it's ready to cut. 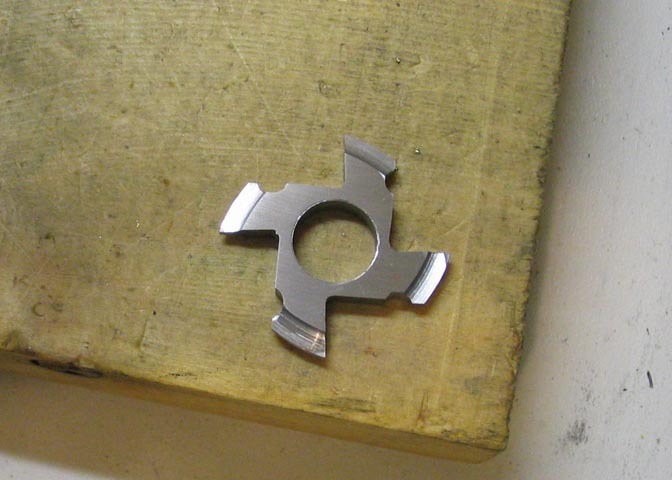 or you will end up with a gear cutter with teeth of differing widths. 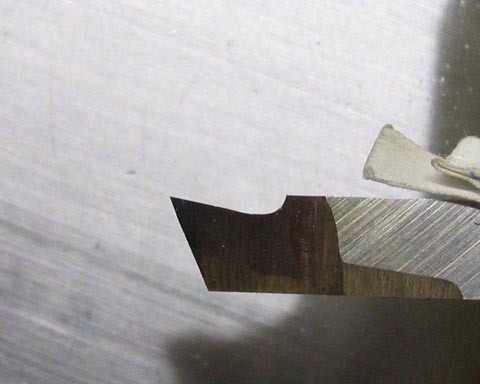 cutter must be left for future sharpening of the cutter. 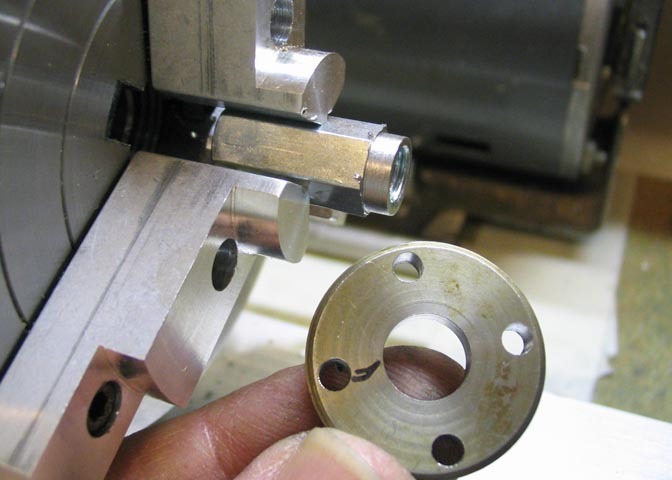 jig holes left in the cutter. 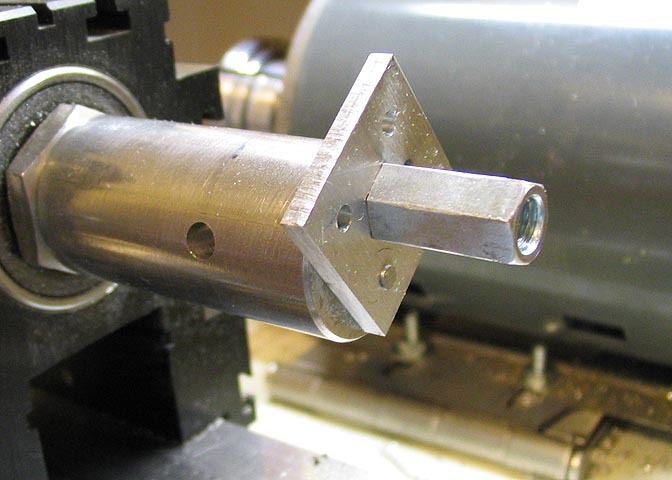 The cutter is removed from the jig, and deburred. 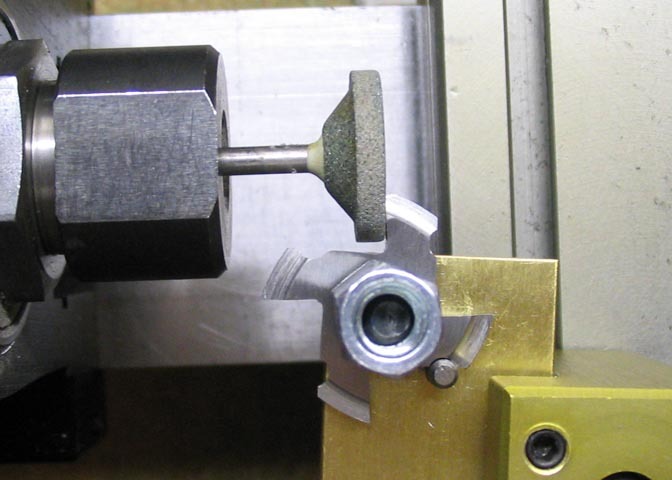 way the cutter is re-sharpened when needed. 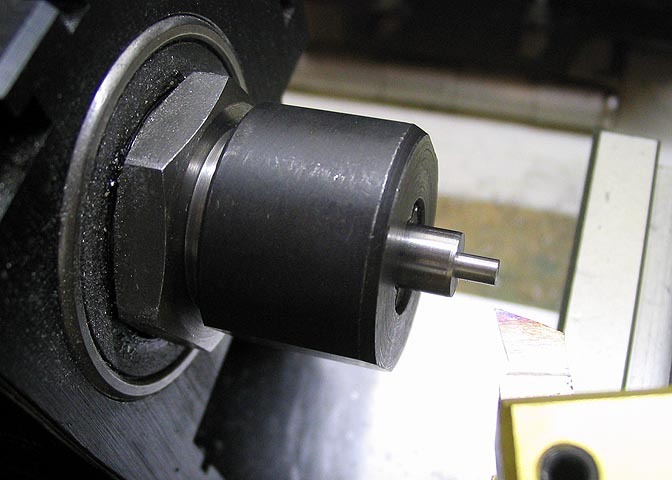 Don't forget to cover the bed/ways on your lathe when grinding! it will be ready for use.